Southside springs to life again in August with a packed weekend of fun for Summer in Southside with entertainers from the UK and overseas heading to Hippodrome Square, Arcadian Piazza, Hurst St and Inge Street. 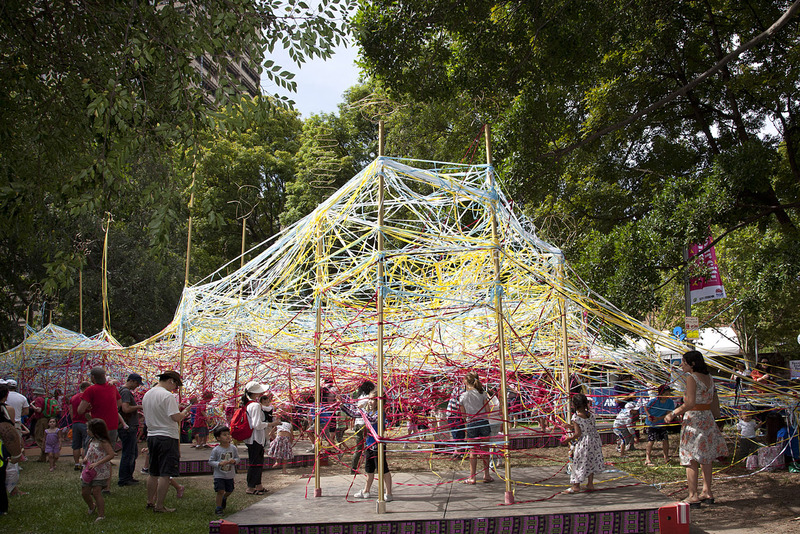 Tangle (pictured) by Australian company Polyglot; a giant weaving play space using coloured elastic to create a vibrant, live interactive artwork made by children and their families. Bench by Mimbre, a small and beautiful acrobatic performance about the everyday theatre and dance of life. Loneliness and happiness, bag-ladies and runaway brides, spell-binding moments mixed with the comic and ordinary. Highly-skilled acrobatic theatre using circus and dance to illuminate human connections. Larger than Life by Scottish company Orkestra del Sol, a sensational new outdoor presentation for 2015. The show weaves Honkstep (the Orkestra’s original brass-driven dance music), comic characters, crowd interaction and daft moments into a new show for all the family. Bruce Airhead, the metamorphosis of man into a 6ft balloon in this original comedy show. Bruce Airhead, with a volunteer, uses a voice-activated vacuum cleaner to inflate a six foot balloon. Broadcasting on 69.9FM is Bramble FM a comic travelling radio roadshow. Watch as the Bramble FM caravan hosts a surreal and hilarious rock roadshow fronted by Maureen Clarke and Lesley Beauchamp. With a thumping soundtrack of world class music provided by their legendary stable of DJs these two architects of idiocy present absurdly popular regular features, eclectic dance moves and in-the-moment improvisation. The Lift by Wet Picnic is a roving theatrical experience that envelops its audience, welcoming them into a world of captured moments, giving them a surreal experience that they won’t forget. An elegant elevator (on wheels) arrives accompanied by three bellhops. The international award-winning acrobatic duo Skate Naked have been performing their particular brand of insane comedy for 20 years, winning both European and world titles in street performing. Their latest show WHIPLASH is mix of mail-biting stunts and ridiculous situations. Fresh from Glastonbury 2015, Dolly the Giraffe is a made-to-scale interactive puppet who loves to munch leaves, nibble hats and have a good old poo! On Saturday 29 August there will be additional outdoor acoustic performances by local artists in the Arcadian, provided through a new partnership formed with Birmingham Promoters and The Glee Club. There will also be an after-party event on the evening of Saturday 29 in Thorp Street’s StageSide bar from 8pm to 11pm, hosted by Birmingham Hippodrome’s Youth Ambassadors. On Sunday 30 August, alongside the outdoor performances, there will be morning workshops in DJ’ing, MC’ing, B-Boy, break-dancing and street art, followed by an afternoon of hip hop battles supported by new urban street art festival City of Colours. This entry was posted in Art, Birmingham, Performance, Theatre and tagged Art in Birmingham, Birmingham, Southside, Summer in Southside, Theatre. Bookmark the permalink.